Berries. Summer. The two words are synonymous with each other! I was so happy to find a pick-your-own blueberry patch in Salisbury, MD (Garden of Eden Orchards for all you locals folks) – which is about 30 minutes north of me. The boys and I went the week before last, and we had so much fun filling up our pail with blueberries. Hoping to get back up there this week to pick some berries for freezing! These bars had been on my radar to make since they popped up on one of my favorite sites earlier in the month in a recipe roundup for the 4th of July. 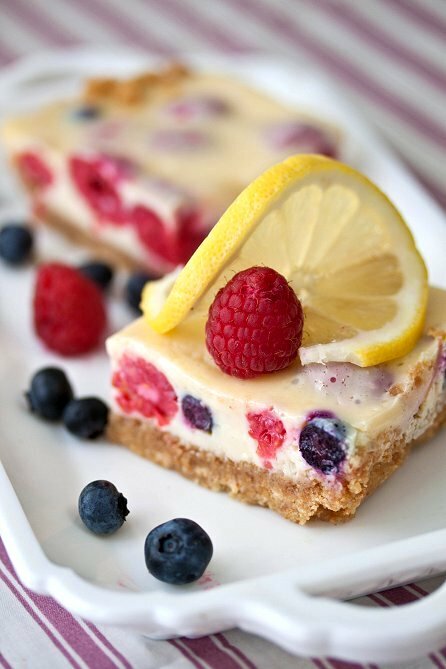 A sweet/tart lemon bar, studded with gorgeous raspberries? Sign me up! When I went to make them, some of my raspberries were not at their most pristine condition – so, I tossed in some blueberries to fill the holes left behind by the less desirable raspberries that I had to chunk. These were super-duper easy, a quick bake time – which is wonderful in this “hotter than the hinges of Hell” weather we’ve been having. And, aren’t they pretty? I really do love bars for dessert. It’s more of an indulgence than a cookie, but lighter than a cake. Take advantage of the gorgeous summer berries while they are in season! Preheat your oven to 350 degrees F. Line 8×8 inch baking dish with aluminum foil. Set aside. In a medium bowl, combine graham cracker crumbs, melted butter, sugar, and lemon zest until moist. Press crumbs into the bottom of the prepared dish. Bake for 10 minutes. Remove from oven and allow the crust to cool to room temperature. Once cooledl, whisk the egg yolks and condensed milk in a large bowl until combined. Whisk in the lemon juice and lemon zest, until mixture begins to thicken slightly. Carefully fold in the berries. Pour the filling over the graham cracker crust. Bake for 15 minutes, or until just set. Cool to room temperature, remove from pan, and then chill for at least a few hours before slicing. For a quicker set, stick into the freezer for about 30 minutes. Cut into bars and serve. Bars can be kept in refrigerator for up to 5 days. These look absolutely perfect! Great photo! I made some bars that look very similar for the 4th, but they had cream cheese in the filling. I will be giving yours a try, I can not resist lemon. I can never resist berries with lemon! They look lovely – perfect for the summer!